The late 1850s was an era when Spanish 1/2, 1, 2, 4, and 8 reales circulated right alongside United States issues. By the end of the decade, however, discoveries of gold fields in California and Australia drove down the world market price of the metal to a point where gold became cheaper in terms of silver, eventually causing the bullion value of many silver coins to exceed their face value. With the increase in silver’s price, vast quantities of coins were melted for export to Europe. By 1850, silver coins were disappearing everywhere. Stores, hotels and railroads began to pay premiums for coins. Commercial life was chaotic. The U.S. public and commercial establishments tried to adapt to the rising silver price. Since the degree of wear determined the weight of silver in a coin, the public evaluated their coins, spending the worn ones and hoarding high grade ones. Banks and post offices discounted the Spanish coins by allowing only 23 cents for a two reales (25 cents), 10c for one reale (12 ½ cents) and 5 cents for a 1/2 reale or medio (6 ¼ cents). The U.S. Government, however, ignored the fact that the coins were worn and paid the full value to keep commerce as stable as possible. On January 9, 1849, the Chairperson of the Committee of Ways and Means, Samuel F. Vinton, wrote a letter to Mint Director Robert M. Patterson requesting proposals for a new cent of reduced size and a 3-cent piece “to be made of copper and some other precious metal.” A year later, Senator Daniel Dickinson, the head of a committee preparing a bill to reduce postal rates, introduced a bill proposing these two coins as a way of buying the new postage stamps and making change. 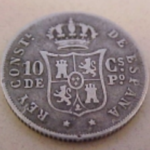 The proposed coins consisted of a cent composed of .100 fine silver and 3-cent coin of .750 silver. Congress did nothing with this proposal until 1851. In that year, it passed the postal rate bill reducing the cost of mailing a letter from 5c to 3c. Since the copper coins in circulation were not legal tender and shinplasters” (private bank notes and merchants’ scrip) weren’t acceptable as payment for postage, how would the public pay for the stamps? Though the reduced size cent wasn’t approved, the Dickinson 3-cent coin was reconsidered and finally authorized by the act of March 3, 1851. It was to weigh 12 3/8 grains and be .750 silver and .250 copper. Since the face value exceeded the bullion value, the coin was sure to stay in circulation. This first three-cent piece, the Type 1, was designed by Chief Engraver James Longacre. The design consists of a six-pointed star at the center, upon which is the Union shield. The inscription UNITED STATES OF AMERICA and the date are around the border. The reverse depicts 13 stars surrounding a C-shaped device within which is a Roman numeral III. Congress hoped that this coin would help sell postage stamps and alleviate the coin shortage. 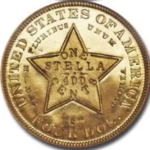 Although critics called the coin “debased,” the public initially loved it. The government loved it also, since a dollar’s worth of 3c pieces was worth only 86 cents in gold. The need for small change was so great that people were impatient for the coin’s release. To avoid a panic, more than 100,000 pieces were manufactured before the mint began to release them. In less than two years, there were 20 million more in circulation. Though inconvenient, change was now available. If you offered a gold dollar for a 5c or 10c article you were likely to get some very worn one and half reales and a handful of 3c coins. These thin, little, insignificant looking coins called “fish scales” by the public and joked about in the press, became the savior of American commerce. As time passed, however, the public became disenchanted with the little coins, as they were easily lost. 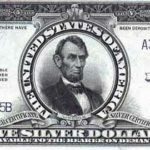 In 1853, the silver problem was resolved by officially lowering the weight of silver coins to compensate for the rise in silver’s price. 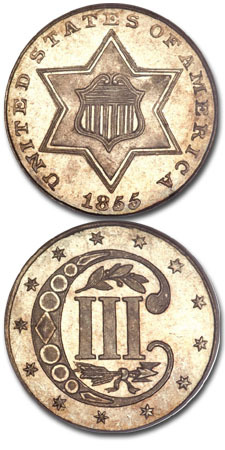 The “Deficiency Act” of March 3, 1853, authorized the second version of the 3c piece making it a 90% fine silver coin like the other subsidiary coinage. 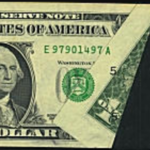 Longacre modified the star on the obverse with the addition of three outlines, and the reverse was changed to show a bunch of arrows below and an olive branch above the Roman numeral III. These changes were supposed to correct the striking problems that plagued the original design and to identify the change in weight and fineness. These first Type 2 pieces, dated 1854, were released on May 22. 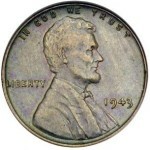 Changes in the design created more problems, and the coin was even more difficult to produce than the earlier version. As a result, it is hard to find well-struck examples. The weakest area is usually toward the borders of the coin. This makes grading more difficult since the surface condition must be carefully considered to detect the difference between strike and wear. Due to improper die preparation, it is also common to see fine, parallel field striations on high grade specimens. Less than five million Type 2 three cent silver pieces were made, and all were manufactured in Philadelphia. Proof mintages are unknown, but probably less than 300 proofs survive today. Though not difficult to find in circulated grades, gem business strikes of this type are very rare, much rarer than gem Type 1 or 3 coins. The rarest of the five dates is the low mintage 1855. Although some collectors assemble complete sets of the series, most of the demand for Type IIs, as with the earlier and later versions, comes from type collectors. The three different types are truly history lessons in miniature.